last night, heaven welcomed my grandpa. my mom’s “daddy”. last night heaven sent a sweet baby too. my sister’s lucia maikalani. 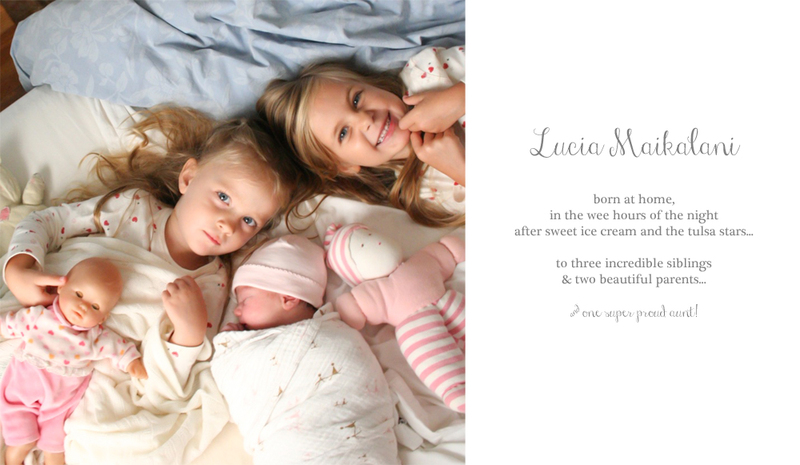 lucia meaning “light” maikalani meaning “sent from heaven”. a few days ago we celebrated the union of ingrid & matt, and then said good-bye as they packed their car for vermont. celebrating and grieving at the same time. my heart is so happy and so sad. thank you trey for sending the pictures — i love her already. i can’t wait to meet her! congrats sklar family!! a beautiful blessing from above for a very special family. So many changes! love the newborn pictures. How fun for these cousins to be so close in age. I’m excited to see pictures from the wedding too! Oh Stacy what a huge roller coaster of emotions…congratulations on your newest little niece she is just beautiful and a special congrats to Ingrid too so happy for her! So glad for all the sweet rejoicing and sorry for the loss of your grandpa friend! I love you sweet, dear Stacy! life is truly such a rich and bittersweet mix of blessings and loss and grief and joy, and God is truly in all of it. love to you and your family, stacy.